The learning object was created to reduce the time needed for students to complete the training and master a pre-test in an introductory costuming class. Step one requires students to become familiar with the parts of the machine by exploring a list of parts the students will be required to interact with in the following activities. Each interactive part has a close up photo and description showing how each part operates. Step two requires students to take a fun quiz by identifying the part described by the function listed. 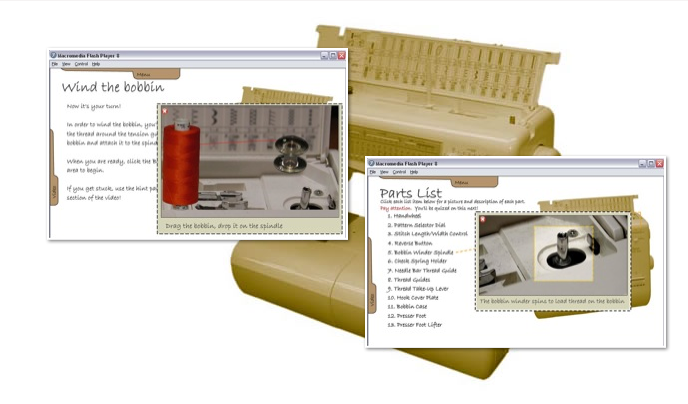 Step three shows an exemplar video of winding the bobbin and loading the thread in various parts of the machine. The video is also available for the iPod (See the job-aide post) video format. Students have been using this as a ‘job aide’ while actually threading the real machine for the first time. Step four is a simulation requiring the students to wind the bobbin, load the bobbin and thread the machine. This entry was posted in Interactive, learning activity, Video and tagged costuming, fine arts, flash, sewing, theater by Britt Carr. Bookmark the permalink.